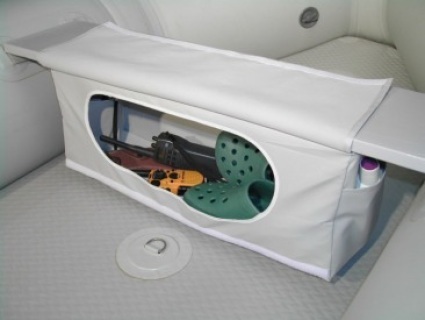 This strong water resistant vinyl polyester storage compartment bag attaches to the bottom of your inflatable boat seat. When not in use, simply stow it out of the way under the seat using handy Velcro tabs (see photos). The storage bag contains side storage pockets both inside and out for sunglasses, cameras, lotion, fishing gear, etc. The bag is big enough to store life jackets, clothing, binoculars, radio, or other boating gear. 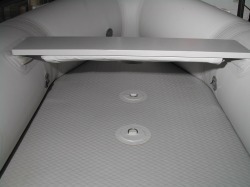 No longer will you have wet dirty gear because there is no place to put it other than on the boat floor. 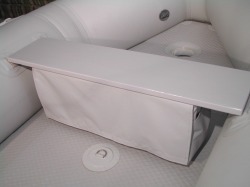 The Under-seat Storage Bag hangs above the floor of your inflatable keeping the contents clean, dry and safe. Installs in minutes. Simply attach the hanging storage bag to the bottom of your inflatable boat seat with 8 short screws provided with the kit. Fits most inflatables. Materials: Vinyl Polyester with plastic inserts for bottom and top stiffness. Complete vinyl polyester storage bag with side pockets. Please allow 2-4 weeks for delivery.